The Hungarian Sighthound, [Magyar Agár] is an excellent horseback hunting companion. It is one of the oldest Hungarian dog breeds with exceptional stamina for long distance running. The migrating Magyars arrived in the Carpathian Basin with Agárs in the 9th century. Excavations of several medieval Magyar gravesites recovered skulls with long noses very similar to the Agár breed. Noblemen continued their great tradition of hunting on horseback with Agárs. King Nagy Lajos I’s Illuminated Chronicle (also known as Chronica Hungarorum) from 1358 depicts Agárs. The second folio has a bear-hunting scene with an Agár-like dog led on a leash by its handler. The third folio has an illuminated "A" with four dogs in a deer-hunting scene. 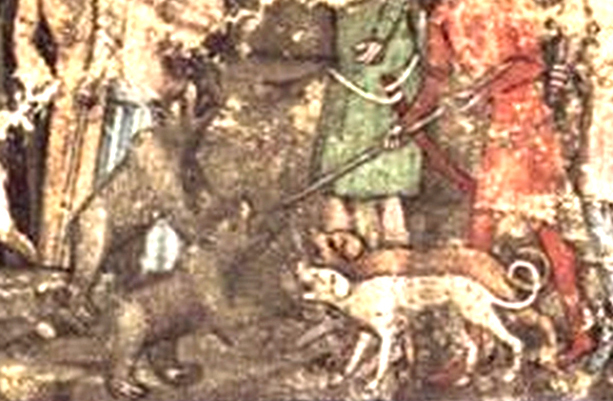 The dog on the left leash strongly resembles an Agár. Martinus Opifex, King Zsigmond’s painter-in-court, illuminated the early 15th-century manuscript History of the Trojan War with common, everyday scenes. 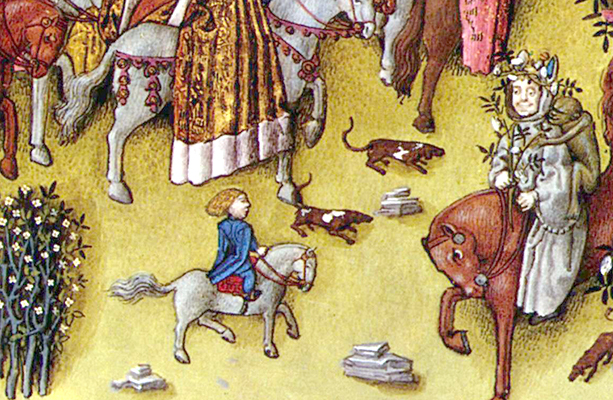 In one scene, he depicts a royal procession that includes children with their Agár-looking dogs. Matthias Graduale from 1487 was created under Mátyás I rule. This religious book is highly decorated with scenes from the humble life of a good Catholic. The lusciously painted deer-hunting scene decorates the edge of the third folio of Eastern Sunday. Its highlight is an Agár catching a deer. You can also still see the great ruins of King Mátyás’ gothic Dog Castle south of Budapest. Legends say he built the castle for his Agárs and their dog-handlers. Records indicate that King Lajos II kept his Agár pack on the largest island in the Danube River—Csepel Island. Before going to war against the Ottoman Empire in 1521, he specifically ensured that his dogs would be bathed twice a week. In the 16th century, after the Ottoman’s invasion of Hungary, the Turks brought hunting dogs that were crossbred with the Agár. The improved Agár became a more robust hunting dog that easily runs 20-mile-long hunting events. During the Turks’ occupation, hunting became a way to escape the daily horrors of the occupation and to evoke memories of the good times prior to the invasion. Hunting with Agárs was a special form of hunting. The mounted hunters rode first, and the unleashed Agárs closely followed their masters. (In the 19th century, it became customary to leash the hunting Agár.) According to documents written by Rákóczi György I, an important nobleman of the era, he had 15 personal Agárs and a dozen for each visiting guest as well as several Agár handlers. Records show Rákóczi caught ten bears, two wild boars, four deer, two wolves, and two foxes during a two-day hunt in 1640. The Agárs were a favored gift. If a "main" Agár—one with fine hunting skills—became famous, it could sell for a lot of money. The official record indicates an Agár sold for 125 Forint in 1591 in an era where it costs 200 Forint to buy a game-filled park, the equivalent of a vacation home in our time. To protect the energy of such special Agárs, they were carried to the hunting area when the main camp was located further from the hunting scene. 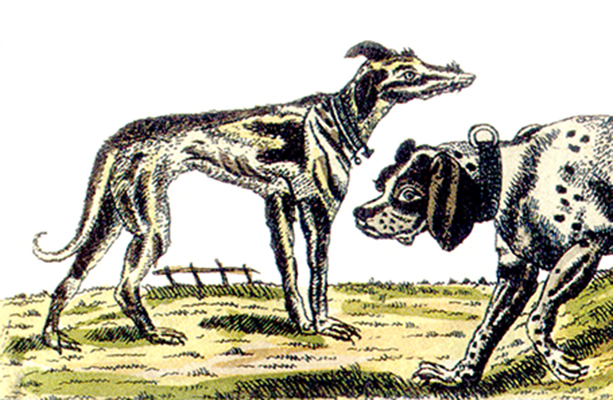 In the 19th century, the Agár was crossbred with English greyhounds for speed. Biting or aggressive Agárs were removed from the breeding stock. Despite the breed’s success, Hungary’s rapidly developing agriculture resulted in a changing landscape. Less focus on forests ended the popularity of hunting. By the end of the 19th century, Agárs were forced into hare coursing—a type of sport, in which Agárs in an enclosed area chased freed hares. Count István Széchenyi founded the first breed club in 1839, the Magyar Agár Society of Pest County, to preserve the noble tradition of Agár keeping. 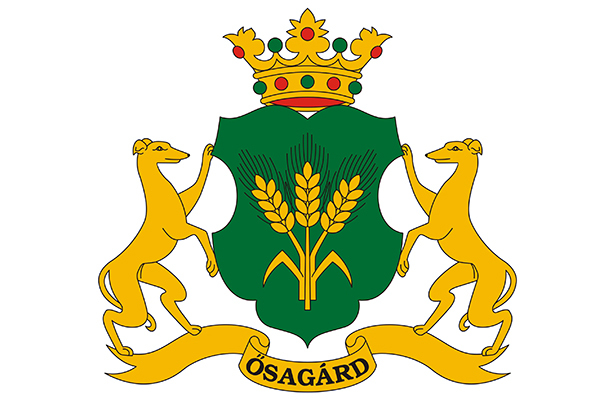 Etymologists believe Agár, as a place name, was first mentioned in the foundation charter of the town in 1193. It is possible that the name referred to the local importance of raising or hunting with Agár-like dogs. It is still discussed if the word is Slavic or Turkish in origin. 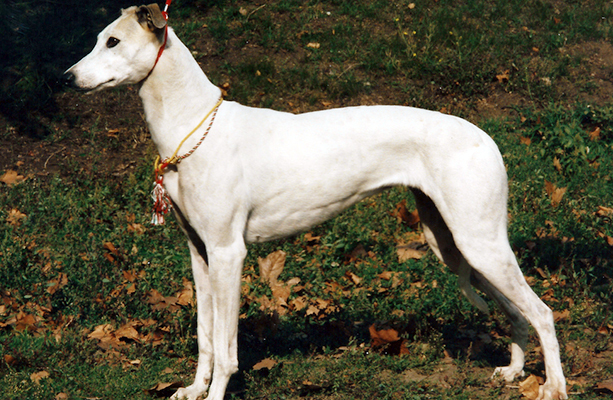 Although the Agár resembles a greyhound, it has a heavier bone structure and its body is longer than it is tall. It weighs 50–70 pounds (22–30 kg) and is about 25–28 in (62–70 cm) height. Its smooth, dense coat can be any color, except blue, blue-white, brown, wolf-grey, black and tan, or tricolor; it has a thicker coat during the winter season. The breed has a broader head and a blunter nose than the common English greyhound. The Agár has uniquely defined rose-shaped ears, oval eyes, and a regal-looking expression. The Agár’s sturdy frame permits long distance pursuits during cooler weather. The Agár is an agile, affectionate breed. Despite being accomplished hunting dogs for centuries, the breed can easily become a house pet if it has a sufficient amount of exercise. The Agár needs a strenuous exercise regimen, and it's best to leave them off-leash during training. Despite the Agár sleeping throughout the day, a well-behaved Agár needs at least an hour of vigorous running per day.